Blue Scientific is the official Nordic distributor for Bruker OES instruments in the Nordic region (Norway, Sweden, Denmark, Finland, Iceland). For more information or quotes, please get in touch. 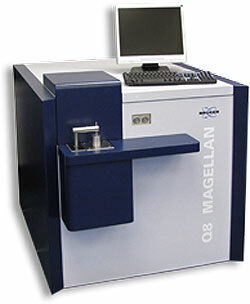 The Bruker Q8 MAGELLAN spark spectrometer statistically evaluates time-resolved measurements of the individual spark. It uses new algorithms for to determine dissolved/undissolved element portions and detect non-metallic inclusions. This enables precise measurement of oxygen content, oxide and sulfide inclusions, and particle size distribution of various oxide and sulfide types (including aluminum oxide, calcium aluminate and magnesium aluminate spinels). Homogeneity and cleanliness are extremely important quality parameters in steel production. Premium steel products in particular demand high degrees of cleanliness and low oxygen levels. SEM-EDX is the traditional method for determining non-metallic inclusions, using a metallographic microscope and scanning electron microscope with EDX. However this is a slow and costly technique. OES with pulse discrimination analysis (OES-PDA) can determine cleanliness and oxygen levels more quickly and efficiently. The process can be controlled in real time, by measuring quality indicators during the melting process. 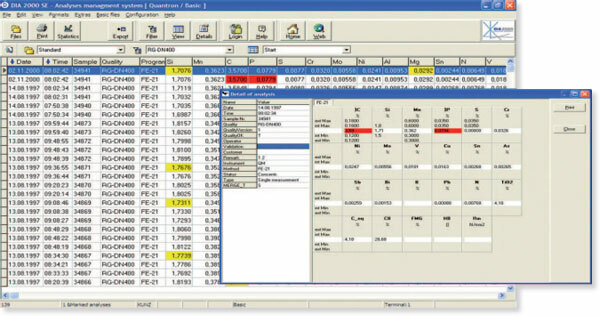 The software features auto-averaging, coloured quality control displays and visualisation of single sparks. You can access the instrument from any PC on your network. For samples with a copper matrix, you can analyse the elemental composition of pure copper with impurities of only a few ppm, with low detection limits of detection and tight tolerances. With OES you can also check the purity of incoming materials to verify delivery quality, assess suppliers and reject substandard materials. By accurately measuring material grades and purity, you can optimise your margins and identify defective materials that could potentially cause problems or halt the complete production line. The traditional method for evaluating purity was by using a microscope (SEM-EDX). However this method is costly, time consuming and provides only partial sample reviews. In contrast, the Bruker Q8 MAGELLAN OES system takes only a few seconds to deliver information about purity levels, oxygen content and chemical composition. Sample preparation is very simple, making the entire process quick and easy to perform. The Bruker Q8 MAGELLAN is high-end OES / spark spectrometer tailored to the particular requirements of metal analysis during the manufacturing process. It’s also suitable for the demanding steel and aluminium industry and high-tech metals in aerospace and automotives.